The Israel Dog Unit (IDU) based in Kfar Tapuach hosted Shomron Council head Yossi Dagan and a delegation from the Shomron Council yesterday. 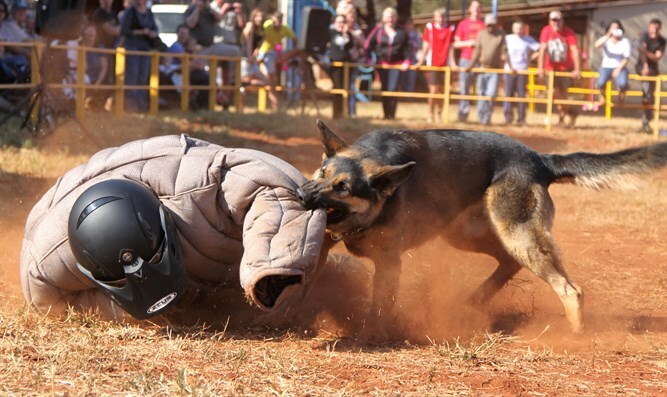 They exhibited search-and-rescue dogs, security dogs, attack dogs, as well as proprietary technologies developed by the unit such as newly acquired drones and thermal cameras being used to locate active terrorists and missing people. Yossi Dagan recently spearheaded a hunger strike outside the Prime Minister’s offices in Jerusalem together with victims of Arab terror and mayors of other towns in Judea and Samaria. The goal was to secure additional funding to improve security on roads and towns in Judea and Samaria. He has now taken initiative to inspire volunteers to help secure towns under his jurisdiction with the use of specially-trained dogs in conjunction with the IDU. Yossi Dagan urged Jews and friends of Israel to support the Israel Dog Unit in their life-saving activities, as well as to volunteer and join the ranks of the unit. “I want to tell all good Jews, anyone who wants to help with the security of Israel and anyone who wants to save lives and strengthen the 'settlements' to support the Israel Dog Unit and all of their wonderful volunteers from all over Israel. I have seen real life-saving activities here, using means that are not even available in the IDF,” said Dagan.